Fall Colors in Charlotte, NC | South Charlotte Newcomers! Fall in Charlotte is a beautiful time of year! The weather is perfect in the fall with sunny days and crisp air; people in the Queen City are enjoying parks, festivals and the fantastic display of trees. The famous tree-lined streets of Charlotte are awaiting the amazingly triumphant colors of fall in the Carolinas! Right this instant, on October 4, in Charlotte, the weather is going to be in the high 80’s. Warm weather not ideal weather for fall colors to burst forth. We must be patient! According to the fall color forecast (yes, Charlotte has a forecast specifically for nature’s fall show) we will have to wait another week or two for our fall extravaganza. The West is in the midst of a winter storm, there is a tropical storm that could unfortunately hit Florida and the Gulf Shores; and Charlotte, the Queen City, patiently awaits the end of a beautiful summer and the beginning of an equally lovely fall. We very rarely have to endure a complicated weather system. We are spoiled in our fair city, with gentle changes of seasons, but we do welcome all to come and enjoy the perfection! Being so close to the mountains, Charlotteans plan quick trips to the many cities and towns nestled along the Blue Ridge Parkway during peak fall color times. The Parkway offers many overlooks and parking areas with spectacular views! Please note: due to the government shutdown, some parks destinations may be closed. Please go to www.blueridgeparkway.com for updates. If driving along the Blue Ridge Parkway isn’t enough for fall fun, just two hours from Charlotte sits wonderful mountain towns awash in amazing fall foliage. Asheville is a favorite spot for weekenders! 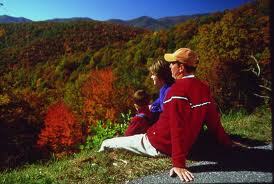 Asheville is a popular Carolina fall destination! Asheville offers all the mountain adventures of hiking, fishing, and camping. Campgrounds, like Asheville East KOA and Cabins are readily available for the outdoor adventurers. For those wanting more luxurious accommodations, the Inn on Biltmore Escape is a great choice. The famous, 100 year-old Grove Park Inn with its $50 million, 43,000 square foot subterranean spa might be the spot to admire the leaves, then relax in pampered bless before dining at one of seven restaurant experiences! Chimney Rock and Grandfather Mountain are wonderful fall foliage enjoyment destinations for the more athletic fall adventurer seeking hikers and rock climbers. Mount Mitchell is the highest point in North Carolina at 6.684 feet and offers a breathtaking 360degree panoramic view. Only tent camping is allowed at Mt. Mitchell, but it is just 27 miles from Asheville accomodations. Be patient Carolinians! Peak fall colors are expected to erupt in splendor in approximately one to two weeks! Whether strapping on the hiking gear or pulling on designer boots, North Carolina will wow you with fabulous fall foliage!